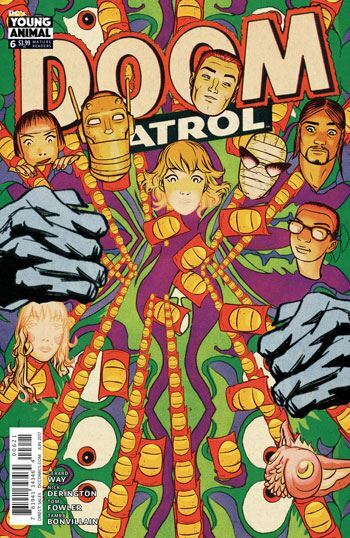 Way and Derington bring the first Doom Patrol story arc to a big finale in this issue, and it’s one that is sure to delight any long time fans of the series. Crazy Jane is central to this tale. She is now running a cult, and preparing to use another gene bomb, like the one that the Dominators set off, which caused each of her 64 personalities to manifest super powers. But this is not quite the Crazy Jane we know and love, for reasons that become apparent as the issue progresses. One thing that concerned me about this story was that Jane had become sane at the end of the Grant Morrison series, and lost her powers. She had made few appearances since then, but nothing really indicated that her split personalities, and powers, had returned. Of course, without them, she is not a terribly dynamic character. This story returns those essential elements to the character, without completely denying the progress she made at the end of Morrison’s run. Getting “cured” of mental illness is not a one shot, all better deal. It’s a constant process, a constant fight, and one Jane will always have to endure. A wise, and realistic, move on Way’s part. And, on a far lighter note, that means that we get to see Cliff Steele in Jane’s Underground again, and gosh have things changed down there! There are a lot of great fanboy moments, and a lot of fun in what is really a fairly dark tale. Great moments for Flex Mentallo, Casey Brinke and Negative Man. I also an really enjoying the slow development of Sam, Casey’s partner in Danny the Ambulance. 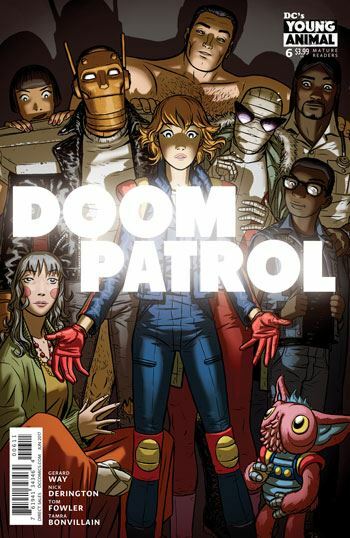 Sam more or less takes the role that Joshua Clay had in Morrison’s run, the normal person thrust into the middle of the Doom Patrol’s insanity. His friendship with Casey started him down this path, but we have seen his relationship with his unusual son, and in this issue we meet his missing wife, one of Jane’s cult members.